I have to giggle....I am sometimes a bit slow to cotton on the The Plot - generally speaking. 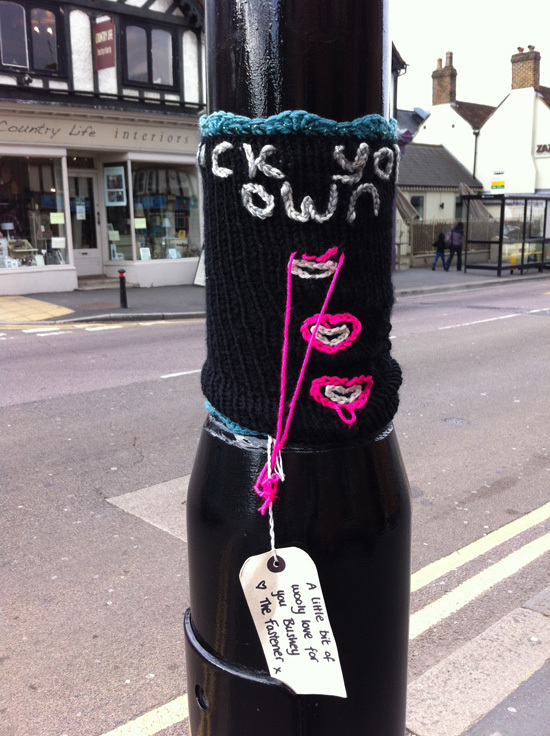 We just took a walk into our little 'village' and encountered a Yarn Bombed light post. We stopped, we looked, we smiled. I thought - that's pretty cool! I haven't seen yarn bombing in person before. Seen lots online, but never in real life. Then I thought - Hang On, I have e-mailed this person called The Fastener before!!! Not actually met her, but spoken on e-mail, about something completely unrelated. Anyhow, long story short, I looked at her website and see that once again I am late to The Plot. It appears that it was installed a month ago already! Honestly, I have walked into town more than once since it was put there - I just somehow missed it. Go have a look at the original pics here. It was covered in flower brooches intended for people to take home and enjoy and love. How brilliant and generous...can you imagine home much time it must have taken to knit and pull it all together?! Rats - it makes me want to do something generous and colourful now...like I don't have enough on my plate already. Anyhow, go have a look at her blog and see what other clever bits of constructed yarn she has left lurking about.